A country staple, traditional mason jars have been around a long time – for over 150 years in fact! The last few years, however, have seen a huge upsurge in the number of mason jars being sold and used, especially among the DIYers out there. It’s not surprising that we’ve embraced the humble mason jar though, it’s an incredibly versatile vessel with a seemingly endless list of uses! Proving that canning jars aren’t just valuable in the kitchen, here are 23 inspired ways to use mason jars in the garden. 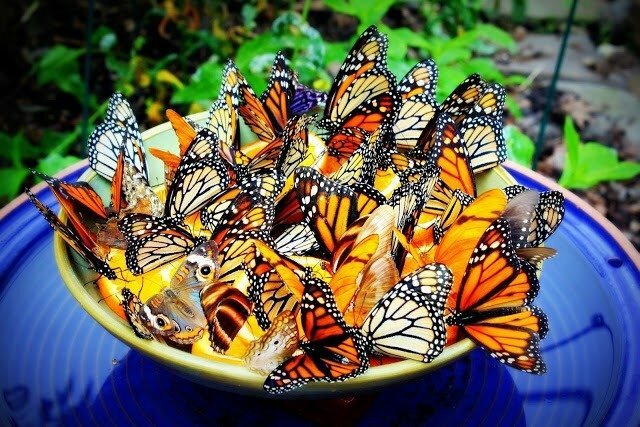 Amateur ornithologists will relish the opportunity to fashion a bird feeder from a simple mason jar, allowing them to view these winged beauties up close every day. Just ensure the feeder is positioned out of the reach of neighborhood cats and other predators! All you need is a jar, some twine and a small round chicken feeder. Hardy little succulents are one of the most popular plants to grow, particularly as these desert natives are next to impossible to kill and seem to thrive on neglect! Liven up your garden with varying sizes of mason jar planters filled with succulents – they make a perfect display for backyard entertaining. Night time summer dining will be a delight with these quaint outdoor tea light holders. Formed from mason jars secured with wire handles and filled with tiny stones, shells or even sand, they bring a soft natural ambiance to tables and patios. Don’t let pesky bugs or worse – blood-sucking mosquitoes – ruin your outdoor dinner party. These cute yet effective DIY citronella candles will keep all manner of flying creatures at bay so you can soak up some summer sun, or enjoy balmy evenings on the porch. Best of all, they’re made from just three items – mason jars, cotton rope and citronella oil. Looking for a festive way to light up the tables or pathways at your Fourth of July celebrations? This super easy craft is great for kids (and adults) and is sure to make for a memorable event. With so many crafts calling for mason jars, you might be left wondering what you can do with all the unused lids. Well, never fear – those flat little discs can also be put to good use in the garden. They make for a durable and eco-friendly alternative to plastic plant markers – and they look much cuter to boot! Cut flowers aren’t just for indoor décor – they are equally at home on outdoor dining tables. Add some beautiful color to your patio tables with a hand painted distressed mason jar, decorated with twine and filled with an array of freshly cut and lightly scented flowers. How many times have you been sipping a fruity cocktail, delicious kombucha or some homemade lemonade in the backyard, only to discover your refreshing drink has been invaded by a struggling bug? In future, you can save your drink (and the bugs!) with a charming DIY lidded mason jar glass and straw. Greet guests to your home or garden with a customized welcome sign. You’ll need some reclaimed wood, a pipe clamp and a mason jar. Decorate your sign with paint, stenciling and a plant or cut flowers – guaranteed to make yours the most inviting garden on the block! Your outdoor wedding or family barbecue will look like a million bucks with this handcrafted table centerpiece – which can be made for a few dollars! The contrast of the rustic branches and natural flowers with crystals and candles makes for a magical setting. This easy little mason jar light is perfect to hang on the porch – it’s ideal for those who like to read or relax in the tranquility of the early morning outdoors. By night, it looks like the yard is illuminated by a hundred tiny fireflies! To recreate this look, you’ll need wide mouth mason jars, wire, burlap ribbon, a string or two of lights and hooks for hanging. While most chandeliers are all about lights, this garden version is all about the flowers! It’s a fun way to bring color and charm to a garden party or barbecue without spending a dime. All you need are jars, string and a wire basket. One of the most eye-catching herb gardens we’ve seen, this one is made with reclaimed wood, painted mason jars and decorative hanging chalkboards. Keep it outside the back door so you have easy access to all manner of tasty and healing herbs – from basil to rosemary and mint to lemongrass. 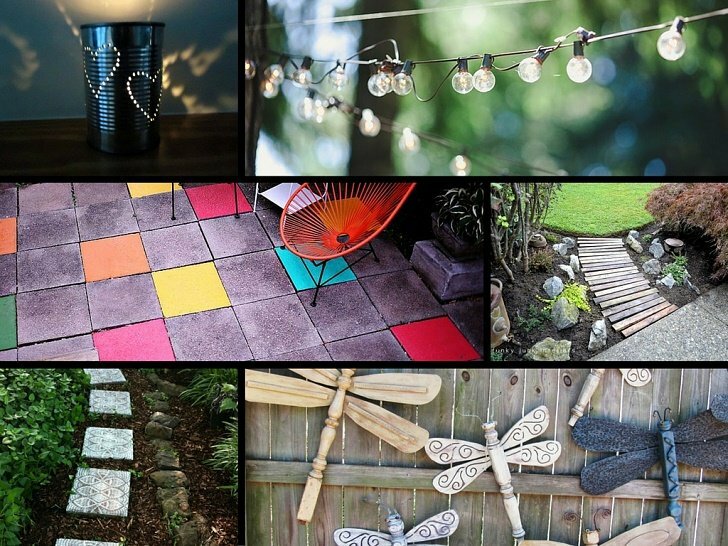 With just three materials – mason jars, stake solar lights and glue – and a little bit of time, you can create these stylish lights to illuminate your walkway or backyard on late summer nights. Make a feature of your plain old garden fence by attaching mason jars filled with candles and adorned with charms. You could also use the jars to house plants or cut flowers instead – or vary it depending on your mood! One of the more functional uses of mason jars in the garden, this soil test allows you to check the structure of your soil. Once you know the ratio of clay to silt to sand, you can decide what plants will grow best in that soil, or aim to make amendments to get the perfect ratio to support the plants already there. Knowing the structure of your soil will also help you determine how much water and fertilizer your plants need. Turn your mason jars into charming pieces of glass art with this wonderful wind chime tutorial. Not only will it bring soothing sounds to your garden, but it’s a great way to use up beads and charms that you have been hoarding. For a different take on the traditional bamboo Tiki torch, why not transform your mason jars into party decorations and give your next backyard event an island feel? These are simple to make and look fantastic! Place painted and distressed mason jars inside a rustic planter box, made from reclaimed wood, for a beautiful addition to a country themed backyard or porch. Fill the jars with cut flowers or low maintenance plants for thrifty but impressive outdoor décor. Another way to utilize mason jars to keep bugs at bay, this project sees the canning jars filled with water, a combination of insect repelling essential oils (like cedarwood, lavender and lemon), slices of citrus fruits and sprigs of fresh rosemary. Topped with a floating tea light candle, they serve multiple purposes – as an outdoor dining centerpiece, a natural air freshener, a bug repellent and a light source! Divide your plants to multiply them with this clever gardening hack. Simply take a clipping of a plant that you’d like more of and put the stem into a mason jar of water. Leave it on a windowsill or porch – anywhere it will get some sun – until roots start shooting out of the stem. Once these roots have developed, you can pot it in soil and watch your newly grown plant flourish. With so many uses of the popular mason jar, it seems we’ve forgotten their original purpose – to preserve the garden bounty! Go back to basics and use your mason jars to can all manner of fruits and vegetables from your edible garden so you can enjoy organic and homegrown produce all year round.